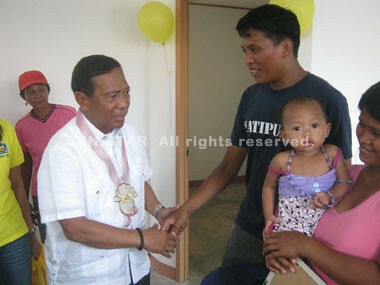 Vice President Jejomar C. Binay, together with Pag-IBIG Fund CEO Atty. Darlene Marie B. Berberabe, spearheaded the turnover and awarding of the house and lot package to Reynaldo and Maricel Evangelio at Pag-ibig Citihomes Subdivision, located at Malanang, Opol, Misamis Oriental on March 4, 2012. The Evangelios won the grand prize in the raffle that was conducted during the implementation of the Pag-IBIG Fund’s “I Do, I Do. Araw ng Pag-IBIG Kasalang Bayan Program that was held simultaneously at SM Malls around the country last Feb 14, 2012. The grand prize is a 32-square meter house and a 90-square meter lot. The house and lot is located at Phase 3 of the subdivision. The program is a nation-wide mass wedding program started by Pag-IBIG Fund this year. The Evangelios are residents of Barangay 13, Isla de Oro, Cagayan de Oro City, whose house was totally destroyed by typhoon Sendong. Five of their immediate family members died during the tragedy. They are presently staying in the Tent City, one of the evacuation centers located in Calaanan, Cagayan de Oro City. There was flood at Pag-ibig Citihomes Subdivision in 2011, but definitely not caused by Tropical Storm Sendong. The October 2011 flood only affected Phase 2. The two other phases were spared. The incessant downpour from early evening to the wee hours of the following morning led to the flooding in Phase 2. Flood water from the surrounding hills of the subdivision, passed through Phase 1 and Phase 3, made the Phase 2 the catch basin of rainwater. The heavy downpour resulted to swelling of the Bunkalalan River, which runs beside Phases 2 and 3. The river is usually almost dry during regular days. You can even walked across it. The swelling of the river aggravated the situation since rainwater could no longer be dumped to the river. The floodwater started to rise at around 5:00 o’clock in the morning. Fortunately, flood water didn’t seep into the houses but it rendered almost all roads in Phase 2 impassable. There was no reported backflow in houses’ comfort rooms; the usual case in flood incident. The river rechanneling system which was implemented after the November 2009 flood incident works during the flood. It had helped ease the water in the swelling Bunkalalan River; without it, tons of excess water from the river would have seeped through the subdivision. Below is an amateur video of the October 2011 flood incident showing the swelling of Bunkalalan River and some shots of the flooded road of Phase 2. The working river rechanneling system is the one you will see nearest the bank. This is always dry during regular days. The outer channel is the Bukalalan River channel. Malanang, Opol (Misamis Oriental) – Homeowners of Pag-ibig Citihomes Subdivision of this town are either hitting the bed late or waking up too early to keep up with the terrible schedule of water supply in the subdivision. Today, water service is only available from late evening to early dawn. The new water schedule was only implemented after Tropical Storm Sendong devastated Northern Mindanao in mid-December last year. The subdivision used to enjoy a better schedule before Tropical Storm Sendong. Water availability was from 10 AM up to 5 AM the following morning. Water service is provided by Cagayan de Oro City Water District (COWD). COWD claims that all their production areas are already fully operational. COWD is imposing a price hike. Minimum water consumption is now at P210.00 fromP168.00. Unfortunately, the increase in price is not coupled with better service; water service to the subdivision is so terrible today.